Beck’s Bolero was recorded in either late 1966 or early 1967 during the golden age of British blues-rock. It is an amazing collabora­tion. Written by Jimmy Page, the instrumental features the band that would have been Led Zeppelin, and is reputed to be Jeff Beck’s favorite all-time recording. The band was pieced together from the creme de la creme of the Yardbirds (Jeff Beck, Jimmy Page), the Who (Keith Moon), and London’s busy rock studio scene (John Paul Jones), and according to Beck, recorded “Bolero’ and a couple of other outrageous things in one day.” Beck’s Bolero was to be a maiden voyage for the all-star lineup until contractual hassles stalled and ultimately killed the project. Keith Moon then returned to the Who, Page and Jones went on to form Led Zeppelin, and Beck got together with an unknown singer, Rod Stewart, to build the first Jeff Beck Group and record the monumen­tal Truth album – which included the original Beck’s Bolero. The track remains a milestone in rock history and points to Jeff Beck’s all-instrumental fusion direction of the next three decades, with its ambitious blend of hard rock, Spanish ethnic, classical, and pop music laced with blues allusions and electronic effects. Beck’s Bolero has – been appropriately called “a shriekback tip of the hat to Ravel shot through with slide guitar and feedback.” The name Bolero refers to a Spanish dance in triple meter (i.e., 3/4 time) with a specific pattern of rhythmic subdivision. What does that mean? Let’s start with rhythmic subdivision. Take a group of three quarter-note beats and superim­pose this rhythm pattern over it: an eighth note followed by a three-16th-note triplet. This pro­duces the characteristic Bolero rhythmic subdi­vision over every beat of the measure [Fig. 1]. The entire Bolero rhythm in 3/4 is this pattern played twice with two eighths on the final beat [Fig. 2]. French Impressionist composer Maurice Ravel in his famous “Bolero for Orchestra” used a variation of this pattern and formed a larger two-measure phrase [Fig. 3]. Jimmy Page, the official composer of Beck’s Bolero, derived his background rhythm guitar groove from an adaptation of Ravel’s pattern in 4/4 time. He increased the values to quarter notes and eighth-note triplets – a pop and rock concession (it works better with the drum beat) – but the Bolero feel remained intact [Fig. 4]. Page strummed the propulsive backing part, Rhy. Fig. 1, on an acoustic 12-string guitar, Gtr. 2. Beck’s Bolero is constructed in definite sections. These are indicated in the music with rehearsal letters: A, B, C, and so on. The theme (Riff A), played by Gtr. 1, is found in sections A and C, and as a fragment in section E. A sparse but gorgeous melody that outlines sensitive tones of the chord progression is delivered with Beck’s familiar sustaining tone of the period, obtained with a Les Paul and Tone Bender fuzz into an overdriven Vox AC-30 amp. The notes are relatively simple to play and should present no problem to an intermediate guitarist. But the emotion is another matter – make sure to observe all the nuances: vibrato, pull-offs (measures 7-10), and accurate string bending intonation. barre across the strings. Remember to play over the frets with a slide, not between them as in nor­mal fretting. Beck sets up a motive with this barre shape, playing a melody which begins on the 2nd string a half step or whole step above the arpeggio, and then slides down into the shape [Fig. 5]. The remainder of the notes are simple diatonic scale lines on the 2nd string. It is recommended to look through slide guitar lesson Faking It. In section C, Beck adds a continual series of pull-offs, labeled Riff B, which are played entirely on the 1st string. The notes of the pat­tern are altered throughout to fit the changing chords but the basic technique remains the same: two fretted notes pulled off to the open high E string. Practice these slowly at first and concentrate on a smooth, connected sound, espe­cially when moving to different positions on the fretboard. As you get the patterns down at a slow tempo, increase the speed and strive for a rolling, unbroken motion in the lines. In section D, the band introduces a heavy rock interlude for contrast. Here, a solid, low-register riff, played in lock step with electric gui­tars and bass – not unlike Zep’s “Heartbreaker” – dominates the music. This figure is first stated in A and moved up on the same strings, using the same melody to C and D, and as such, is a perfect example of the classic blues-rock movable riff. Note the chromatic notes (A-G#-G in the first measure) and the bends on the 5th string. The latter take a bit more strength and control, and should be played with a downward pull on the string. The outro features Jeff Beck’s controlled feedback technique. To get a handle on this approach, first make sure you have enough gain to sustain the notes and to create harmonic (pitch-related), not microphonic (a whistling unpitched shriek), feedback. This may require adjusting your preamp volume, turning up the gain on a distortion unit, and using the bridge pickup. Play the A and G notes (14th and 12th frets on the 3rd string) and try to get the notes to sustain and feedback an octave higher than the fretted notes. Next, experiment standing in dif­ferent positions relative to your amp’s speakers. You’ll notice that one location will give you one feedback pitch while another will give you a dif­ferent one – all from the same fretted note. 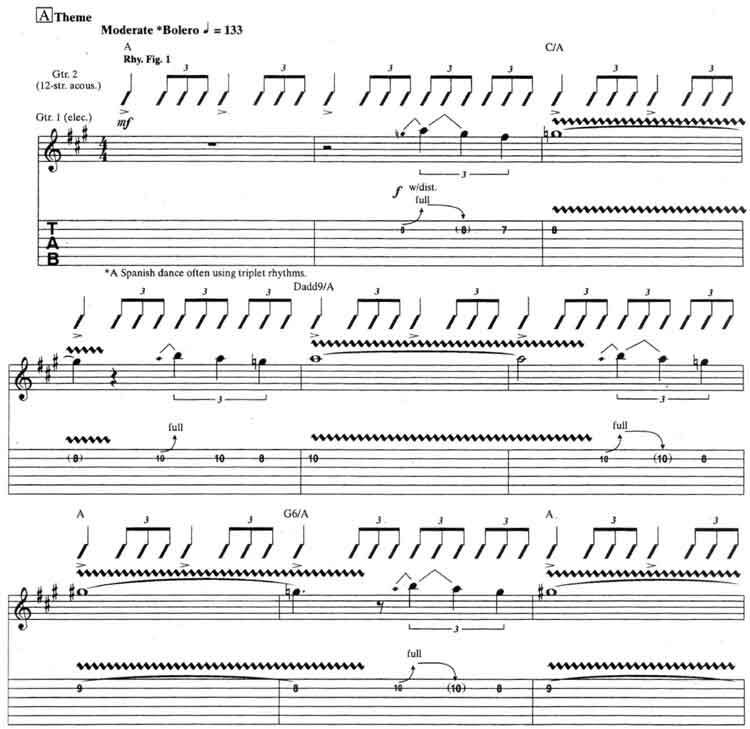 It’s a part of Jeff Beck – Beck’s Bolero guitar tab and sheet. © 2012 - 2019 TabsClub Powered by TabsClub 41 queries in 0.290 seconds.